ESO Supernova Exhibition — How do stars like the Sun die? How do stars like the Sun die? At the end of its life, a star like the Sun grows into a red giant, pushing its gaseous mantle into space. Like the remaining central star, these planetary nebulae slowly fade over time. 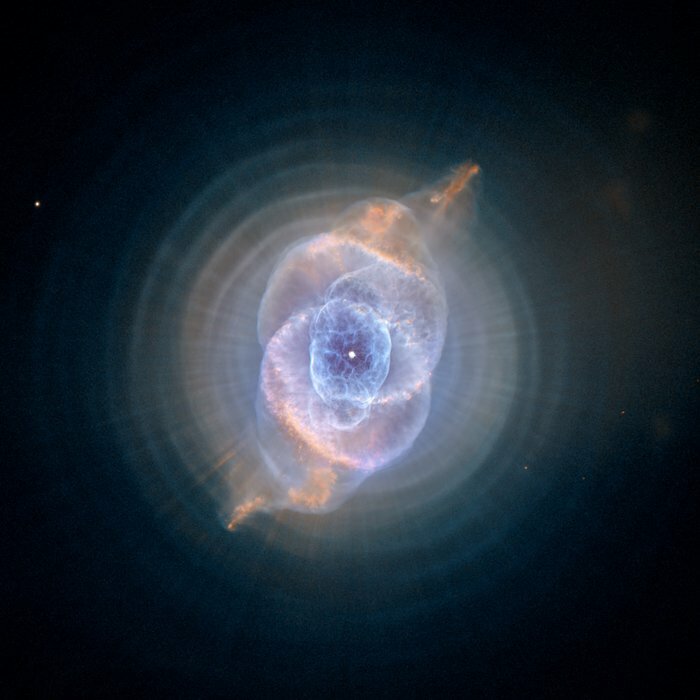 Cosmic recycling: The gas from the Cat’s Eye Nebula will be used to create the next generation of stars. This way planetary nebulae play an important role in galactic evolution. 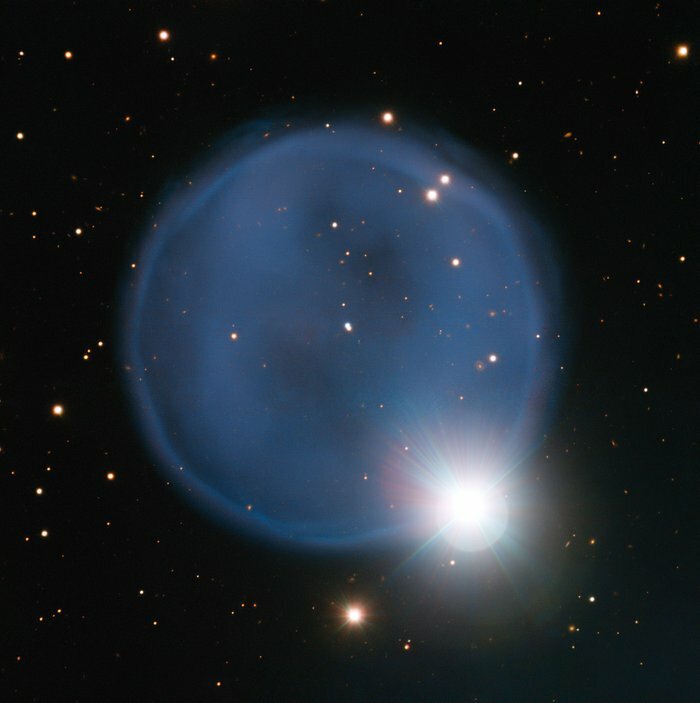 Celestial diamond: Abell 33 is unusually symmetric, appearing to be almost perfectly circular on the sky. It is, by chance, aligned with a foreground star, and bears an uncanny resemblance to a diamond engagement ring. 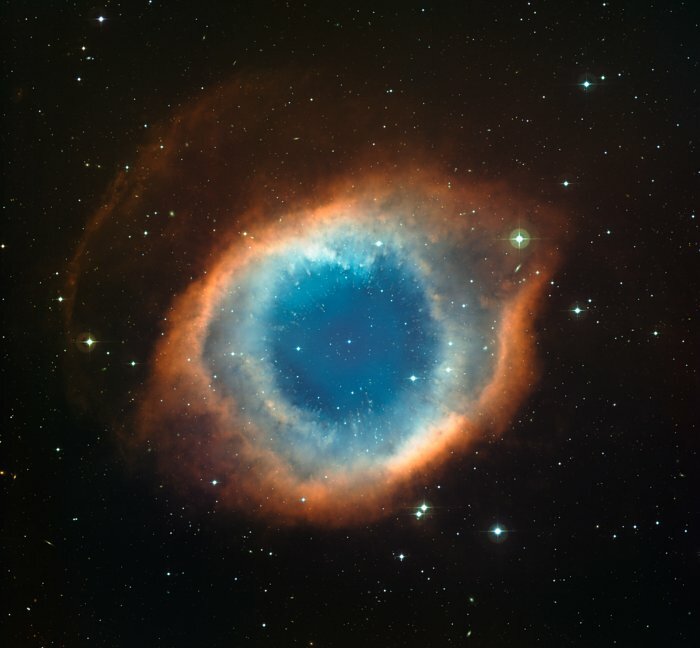 Stellar death on the doorstep: At a distance of just 700 light-years, the 11 000-year-old Helix Nebula is one of the closest planetary nebulae to us. Five billion years from now, the Sun will be a pulsating red giant star. Because of its tremendous size in this phase, the Sun’s gravity won’t prevent the outer layers from leaking away into space at velocities of many thousand km/h. In time, the Sun will be surrounded by an expanding nebula, heated by the ultraviolet radiation of the remaining stellar core. William Herschel coined the term “planetary nebulae” because in his telescope they looked like planetary discs. Directional preference: The bipolar flow of the Twin Jet Nebula is caused by the presence of a second star orbiting the dying red giant. Shape simulation: Computer simulations of gas flows from dying stars shed light on the variety of planetary nebula shapes. Dying stars lose weight. At the end of their lives stars like the Sun blow their outer layers into space. The result: a spectacular, colourful nebula, surrounding a cooling white dwarf star.